The IBM 4247 Model 002 extends the forms-handling capability of the IBM 4247 Serial Matrix printers to lower speeds at lower prices. This heavy-duty impact printer is capable of print speeds up to 400 characters per second (CPS) with a duty cycle of up to 8 million characters per month. Print qualities include DP mode (DP), DP Text mode (DP Text) and Near Letter Quality (NLQ). Environments supported by the 4247-002 include: IBM System 36, IBM Advanced 36, IBM AS/400, IBM RS/6000, IBM S/370 and S/390, IBM PC, IBM PS/2, IBM-compatible PCs, non-IBM systems that support an ASCII parallel interface, and Local Area Networks (LANs). The 4247-002 provides price/performance options to the successful 4247 family. At speeds up to 400/240/120 characters per second (CPS) for DP/DP Text/NLQ respectively, the base printer is configured with Parallel plus either a Coax or Twinax attachment. 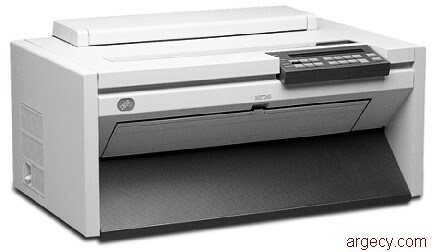 The 4247-002 provides the same forms flexibility as previous members of the 4247 family. This includes one continuous forms path and a manual cutsheet path as standard. A second forms tractor may be added to provide dual continuous forms paper paths. To obtain the most reliable forms capability both sets of tractors may be used for a single paper path. An Automatic Sheet Feed (ASF) with one, two or three input bins for cutsheet paper may be added to the standard configuration. Envelopes are supported in ASF bin 1. The 4247-002 includes an operator panel much like that found on the IBM 4230. Identical to that provided on the 001 model, it includes a 2-line by 40 character display making messages and menus easy to understand. Multiple emulation modes make it possible to easily replace many older printers. ASCII emulation includes IBM Proprinter III XL, IBM 2381 Personal Printer and Epson FX. Coax emulations include IBM 3268, IBM 3287, IBM 4224 and IBM 4230. Twinax emulations include IBM 4214, IBM 4224 and IBM 4230. Native IBM 4247 is the default mode with each attachment. The 4247-002 is a heavy duty printer with a duty cycle of up to 8 million characters per month. The 9 wire print head provides reliable printing in three quality modes, (DP, DP Text, and NLQ), on up to 8 part forms in the front path. LAN attachment is available via the Network Print Server features (FN 4121, 4124, 4164, 4165) attached to the parallel port for ASCII data or by the i-Data International A-S 7913 (RPQ numbers 8B4313 and 8B4314) attachment to the coax or twinax port for Intelligent Printer Data Stream (IPDS) data. The IBM 4247 Model 001 base printer includes a Parallel port plus either a Coax or Twinax attachment. Printers emulated are Proprinter III XL, IBM 2381 Personal Printer and Epson FX80 - 1170. Datastreams supported are PPDS and Epson FX. Printers emulated are IBM 3268/3287, IBM 4224 and IBM 4230. Datastreams supported are 3270/DSC/DSE and SCS. Printers emulated are IBM 4214 and IBM 4230. With the Intelligent Printer Datastream (IPDS(TM)) feature the Coax or Twinax attachment can be driven by Advanced Function Presentation (AFP(TM)) applications supported by Print Services Facility (PSF(TM)) and GDDM(R). The 4247-002 can be LAN attached via the Network Print Server (NPS) features (FN 4121, 4124, 4164, 4165) attached to the parallel port for ASCII datastreams or the i-data 7913 (RPQ number 8B4313 or 8B4314) attached to the Twinax or Coax port for IPDS datastreams. While a Network Print Server and one of the i-data 7913 RPQs (either RPQ 8B4313 or 8B4314) can both be installed on the same 4247, only one of either the Network Print Server or the i-Data 7913 RPQ network attachments can be active at any time. Manual network switching between the ASCII (Network Print Server) and IPDS (i-Data RPQ) is required to switch between the attachments. When attaching the Ethernet 10/100 BaseT Network Print Server (#4164) to the 4247 Printers, a Power Plug (Power adapter) is needed. The IBM 4247-002 complements the current IBM serial matrix family by offering new price options. Fully compatible with the 4247-001, the model 002 provides additional choices to meet speed requirements with all the rich forms handling of the 4247 family. The 4247-002 provides 400 CPS in DP (data processing) print quality mode. The 4247 provides enhanced paper path capabilities over the 4230 and 4232, including multiple continuous form support and Automatic Sheet Feeder (ASF) The key difference however is that with the 4247, the various paper feeds can be installed simultaneously. The 4247 provides a wide range of forms handling capabilities. With the standard tractor set, the printer can be configured for continuous feed push or pull. The push configuration supports document on demand or 'zero tear' operations thus minimizing waste and supporting pre-numbered forms. The base machine configuration also includes a manual cut sheet feeder. With the continuous feed paper parked (mounted in the tractors but out of the print line), the operator can insert a single sheet of cut sheet paper. A second tractor set can be added which enables the printer to feed from two different continuous feed paper sources. A push/pull configuration can be used to manage the more difficult forms and/or batch applications. The standard manual cut sheet feeder can still be used under this configuration. In addition, an optional automatic sheet feeder can be added. This feature consists of one cut sheet input bin and an output stacker. A second and third cut sheet input bin can be added. Input bin one of the automatic sheet feeder will support envelopes. The continuous feeds and manual cut sheet feed can still be used with the automatic sheet feeder installed. IBM 4202 Proprinter III XL, IBM Personal Printer 2381, and Epson FX (FX 80-1050 and DFX 5000/8000) emulation modes for parallel attach. IBM 3268, IBM 3287, IBM 4224 and IBM 4230 emulation for coax attachment. IBM 4214, IBM 4224, and IBM 4230 emulation for twinax attachment. Native 4247 mode drivers for AIX and OS/400 environments. shipped on diskette with the printer. Upper paper supply area is positioned for front feed. Lower paper supply area (floor) is used for rear feed. Contains an adjustable paper output shelf that can be removed. The IBM 4247-002 meets the EPA certification requirements for Energy Star. EMC: Limit A of FCC Rules and Regulations part 15 subpart B, class A (US). Limit B of EN 55022/1987, EN 50082-1/1992 (Europe high voltage only). The Network Print Server (NPS) features have additional power requirements. When attached to the 4247 printer, the Network Print Server features require an external power supply as described below. This power supply is included with the Network Print Server for the 4247 printer. When the ASF is installed, use of the rear tractor is limited to rear-push mode. The manual cut-sheet path can only be selected at the operator panel or with IPDS. It cannot be selected by the 4247 ASCII drivers. Current bar code applications that use barcode escape commands must be modified to use IBM 4247 native bar code commands. The 4247-002 has the following additional limitations when emulating previous ASCII printers. The following commands/functions are not supported when replacing or adding to existing IBM 4224 (Model 301, 302, 3E3), 4230 (Model 4xx or 5xx) or 4232 Model 302. Overall form weight can range from 55 grams per square meter (gsm) (15 lbs) to 150 gsm (40 lbs). When using multiple part forms, all but the front sheet must be in the range of 45 gsm (12 lbs) to 75 gsm (20 lbs) and any carbon paper must be in the range of 14 gsm (4 lbs) to 35 gsm (9 lbs). Total form thickness may range from 0.08 mm (0.003 in.) to 0.635 mm (0.025 in.). Form width ranges from 76.2 mm (3 in.) to 431.8 mm (17 in.) Forms less than 152.4 mm (6 in.) in width should be tested for satisfactory stacking and may require operator assistance. Form length ranges from 76.2 mm (3 in.) to 609.6 mm (24 in.) Forms less than 152.4 mm (6 in.) in length should be tested for satisfactory stacking and may require operator assistance. Black back forms cannot be used in the front continuous form path. Form weight can range from 55 grams per square meter (gsm) (15 lbs) to 80 gsm (21 lbs). Total form thickness may range from 0.08 mm (0.003 in.) to 0.35 mm (0.014 in.). Continuous forms with adhesive labels are not recommended for the rear paper path. Paper outside the specification ranges given above must be tested by the customer for proper operation. Some multiple part forms such as mailers, or thick/heavy perforations may have problems when using the PARK function. These forms should be tested for proper operation. For optimum performance, printing should be restricted to 6.4 mm (0.25 in.) from all edges, holes, or folds on the forms. Form weight can range from 50 gsm (13.3 lbs) to 120 gsm (32 lbs). However, weights less than 75 gsm may be subject to registration problems when printing in NLQ mode or graphics. Paper weights outside this range must be tested by the customer for proper operation. For optimum performance, printing should be restricted to 12.7 mm (0.5 in.) from all edges, holes, or folds on the forms. The 4247-002 Automatic Sheet Feeder, which can be installed and/or removed by the operator, provides for automatic feeding of cut sheet paper. It includes a stacker and one input bin as standard. The stacker also serves as the output bin for the manual cut sheet input path. One or two additional bins may be added for a maximum of 3 input bins. Each automatic bin holds up to 120 sheets of variable width 80 gsm (20 lb) single-part paper. Multi-part forms (up to 3-part) can also be used. Input bin 1 will also support envelopes. The output stacker holds up to 150 sheets of 80 gsm (20 lb) single-part paper. Bin selection can be controlled by the host system or from the 4247-002 operator panel. All operator control is from the 4247 operator panel. Note: Up to 30 USA #6 (220 mm - 110 mm (8.66 in. x 4.33 in.)) or #10 (241.3mm x 104.8 mm (9.5 in. x 4.12 in.)) envelopes with a maximum thickness of 0.52 mm (0.021 in.) and a maximum thickness variation of .3 mm (.012 in.) may be fed in ASF Bin 1. Form thickness of a single sheet should be a minimum of 0.086 mm (0.0034 in.) and a maximum of 0.117 mm (0.0046 in.). (Also see multi- part forms specifications). RS/6000 workstations (excluding POWERserver 930). Token Ring or Ethernet networks via the Network Print Server features. IBM PS/2 and IBM Personal Computer LPTx ports and to a Token Ring or Ethernet LAN via one of these computers. IBM-compatible PCs utilizing the parallel interface. AS/400 twinax terminals including IBM 348x InfoWindow II display stations, IBM 3477 InfoWindow display station, and IBM 3197 display workstation. IBM 3174 Controller - Terminal port (using Release A5.5 or later, Release B4.0 or later, Release C6.0 or later). ES/9370 Processor Workstation Controller (feature code 6020 or 6120). ES/9371 Processor - 3270 Adapter. ES9000 - 9221 Workstation Subsystem Controller (feature 6120). Token Ring or Ethernet networks via the i-data 7913 RPQ for the IPDS datastream. IBM 5394 and IBM 5494 Control Units. The 4247-002 can use the IBM Personal Printer Data Stream (PPDS) in IBM 4202 Proprinter III XL or IBM 2381 Personal Printer emulations by choosing the corresponding device driver for the systems listed below as supporting the PPDS datastream and the corresponding emulation on the Operator panel. In Epson FX emulation mode the 4247-002 can print files coded for the Epson FX-1050 using the Epson ESC/P printer control language. Note: (3) Host selection of paper paths when using the ASF feature with Host Print Transform is limited to a total of three paper paths. Additional paths may be selected from the operator panel. Note: (1a) Requires APAR PQ01129 for MVS, PQ01130 for VM or PQ01131 for VSE. Note: (5) Supported in 4224 mode only. Note: (6) Requires OS/400 PTF SF32911 for AFP=NO and OS/400 PTFs SF32566, SF32567 and SF32568 for AFP=YES. Note: (7) Requires OS/400 PTF SF33118 for AFP=NO and OS/400 PTF SF30477 for AFP=YES. Note: (8) PSF/MVS will support a coax or twinax printer attached via the i-data 7913 RPQ. Requires PTF UW29854 for PSF/MVS 2.2.0. Note: Proportional spacing on the Coax or Twinax attachment changes the characters per inch to approximately 11.5 CPI. Proportional spacing on the parallel port is a separate attribute and can be used at all CPI settings with each of the character styles listed above. The following publications are shipped with the product. Additional copies (English only) are available immediately. The Maintenance Manual (SA24-4400) may be ordered through the "Puborder" or MES process for a charge. Provides dual tractor path capability with which either front push- pull mode or dual push mode configurations may be utilized. Up to 8-part forms (4-part in rear push mode) may be used. If used for dual push mode this tractor feature can be installed in the 4247 simultaneously with the primary tractor assembly, the manual cut sheet, and the ASF. Provides an additional input bin for the base ASF feature (FC# 4015). In combination with the base ASF feature, this feature may be used to add a second and third input bin (order two) configuration of the 4247. Provides attachment capability to System 36 and AS/400 systems. This feature can not be installed with feature #4170 - Coax attachment. Removes coax attachment and adds twinax attachment via field conversion. Field Installation: Yes - Parts removed as a result of this feature change become the property of IBM. Provides attachment capability to IBM 3174, ES9370, and ES9000 systems. This feature can not be installed with feature #4140 - Twinax attachment. Removes twinax attachment and adds coax attachment via field conversion. Provides a sturdy printer stand designed for the IBM 4247 Printer. Provides capability to add the euro common currency symbol support and support of code pages 858 and 1140 - 1149 to printers with serial numbers lower than 25204. Printers with higher serial numbers come with this level of euro support standard. Maximum: One. Prerequisites: (4140 or 4141 or 4142) and (4820 or 4821). Field installation: Yes. Customer Setup: No. Provides capability to add the euro common currency symbol support and support of code pages 858 and 1140 - 1149 to printers with serial numbers lower than 25204. Printers with higher serial numbers come with this level of euro support standard. Maximum: One. Prerequisites: 4170 or 4171 or 4172. Field installation: Yes. Customer Setup: No. Provides capability to add the euro common currency symbol support and support of code pages 858 and 1140 - 1149 to printers with serial numbers lower than 25204. Printers with higher serial numbers come with this level of euro support standard. Maximum: One. Prerequisites: (4170 or 4171 or 4172) and (4820 or 4822). Field installation: Yes. Customer Setup: No. Provides Intelligent Printer Datastream (IPDS) capability for twinax or coax attachments. Adds IPDS to a non-IPDS twinax 4247. Adds IPDS to a non-IPDS coax 4247. Parallel attachment cables may be ordered at initial order time or at a later date by feature code. The IBM 4247 is attachable to the same parallel cabling as other IBM printers including the IBM Proprinter III XL, the IBM 2381, the IBM 4224, and the IBM 4226. The IBM 4247 is attachable to the industry standard IBM PC Parallel cabling. For best results, purchase the proper cable from IBM (reference the feature code section). Coax or twinax attachment cables must be provided by the customer and are not orderable with the IBM 4247. One ribbon is supplied with the printer. The following diskettes are shipped with the printer. AIX printer driver for native IBM 4247 operation. OS/400 printer driver for native IBM 4247 operation.